World-famous Lausanne Chamber Orchestra will perform at the 10th International Mstislav Rostropovich Festival. The concert will take place at Azerbaijan State Academic Philharmonic Hall on April 23, Azertag reported. 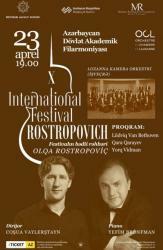 The 10th International Mstislav Rostropovich Festival will be held in Baku on April 22-27. The festival will bring together world-famous musicians from Azerbaijan, Russia, Germany, Switzerland, Spain, etc. The festival participants include the Chamber Orchestra of Lausanne (Switzerland), the St. Petersburg State Academic Ballet Theater of Boris Eifman (Russia), MünchenKlang Orchestra (Germany), Boris Berezovsky (piano), Sergey Krylov (violin), Efim Bronfman (piano), conductor Joshua Wallerstein and others. Lausanne Chamber Orchestra is a Swiss chamber orchestra based in Lausanne, Switzerland. As a partner of the Lausanne Opera, the OCL regularly appears in the orchestra pit during the opera season. As part of its mission to promote music among young listeners, the orchestra offers a number of varied concerts. The OCL performs some 100 concerts each season at the Salle Métropole in Lausanne, its place of residence, as well as throughout Switzerland and abroad. The ensemble is regularly heard at the Théâtre des Champs-Elysées and Salle Pleyel in Paris, at the Alte Oper in Frankfurt, at the Accademia Nazionale di Santa Cecilia in Rome, at the Musikverein in Vienna, as well as at festivals such as the BBC Proms in London, the George Enescu Festival in Bucharest and the Rheingau Musik Festival. Born in Baku, Mstislav Rostropovich was internationally recognized as a staunch advocate of human rights, and he was awarded the 1974 Award of the International League of Human Rights. He inspired and premiered over 100 pieces and formed long-standing artistic partnerships with such prominent composers as Dmitri Shostakovich, Sergei Prokofiev, Henri Dutilleux, Witold Lutosławski, Olivier Messiaen, Luciano Berio, Krzysztof Penderecki, Alfred Schnittke, Norbert Moret, Andreas Makris and Benjamin Britten. A five-time Grammy Award winner, he has become one of the West leading conductors. He was married to the soprano Galina Vishnevskaya, who was named a People's Artist of the USSR in 1966.They performed together regularly.